On March 15, 2018, Montreal Digital Spring launched its new season among very special guests! Their Majesties the King and the Queen of the Belgians, along with numerous Belgian dignitaries, including the Minister-President of the Government of the Brussels-Capital Region Rudi Vervoort, Quebec Premier Philippe Couillard, Ministers Dominique Anglade and Christine St-Pierre, as well as the Mayor of Montreal, Valérie Plante, attended the #intersections VOL.7 conference on the theme of algorithmic governance. In front of a full theater at the Canadian Centre for Architecture, Professor Hugues Bersini, member of the Royal Academy of Belgium, Professor at the Université Libre de Bruxelles and co-director of the IRIDIA laboratory opened the event with a conference on this ‘benevolent’ Big Brother to whom we slowly accept to entrust the future of our societies. Following the conference, Jane Murphy, lawyer and co-founder of the European Data Protection Office, Gilles de Saint-Exupéry, lawyer and Lex Start partner, Éric Rodriguez, co-founder of lex.be and Jonathan Berte, CEO of Robovision, joined the discussion for a panel moderated by the journalist Catherine Mathys. “Progress is a good thing in itself, it is necessary, it is indispensable. However, as Hugues Bersini said, if public authorities are not taking an active role in monitoring this progress, we must fear the abuses. Progress has neither moral nor judgment, it is only depending on how we are going to use it that will make it useful, or not, for the evolution of our society”, added Minister-President of the Government of the Brussels-Capital Region, Rudi Vervoort. Let’s not forget that Montreal has recently been selected to become the headquarter of the AI-Powered Supply Chain Supercluster. The economic impact of this project amounts to more than $16.5 billion and more than 16,000 jobs should be created over the next 10 years. (source: City of Montréal). 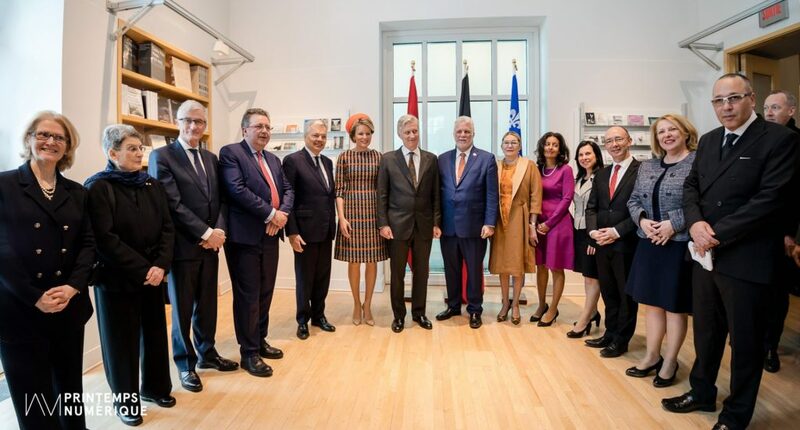 This event, presented in collaboration with the Brussels-Capital region, was part of the state visit of Their Majesties the King and the Queen of the Belgians and was held in the presence of Their Majesties the King and the Queen of the Belgians. Consult Montreal Digital Spring study: Understanding and developing Montreal’s digital creativity ecosystem: a lever for local development and the city’s international influence. Watch the discussion panel: Algorithmic Governance – Are we about to entrust our societies with machines and algorithms? Montreal Digital Spring, produced in association with the Journal Métro, has received $225,000 in financial support from the City of Montréal in 2018. The Secrétariat à la région métropolitaine also grants the Printemps numérique $75,000 from the Metropolis. This project is also supported by Concertation Montréal, Montreal Tourism, and La Vitrine. Montreal Digital Spring (Printemps numérique) is a non-profit organization whose primary mission is to boost digital creation and creativity through various activities of event productions, communication, curation, networking, and mediation. Since 2014, its flagship event – the Printemps numérique (digital spring) – is held annually in Montreal from March 21 to June 21. This season is both a space for networking between the arts, industry, education and research sectors and a showcase of their productions. The diverse programming of Montreal Digital Spring makes digital arts more accessible to a larger audience while attracting an international clientele. Throughout the year, the organization is establishing itself in the various digital sectors by organizing forums and events that foster conversations around digital trends and issues of digital transformations.